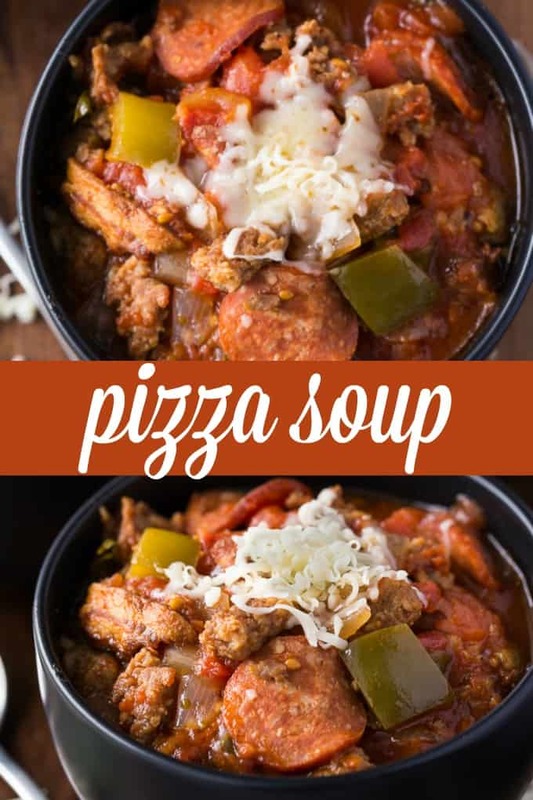 Pizza Soup is loaded with three different types of meat and delicious down to the last drop. 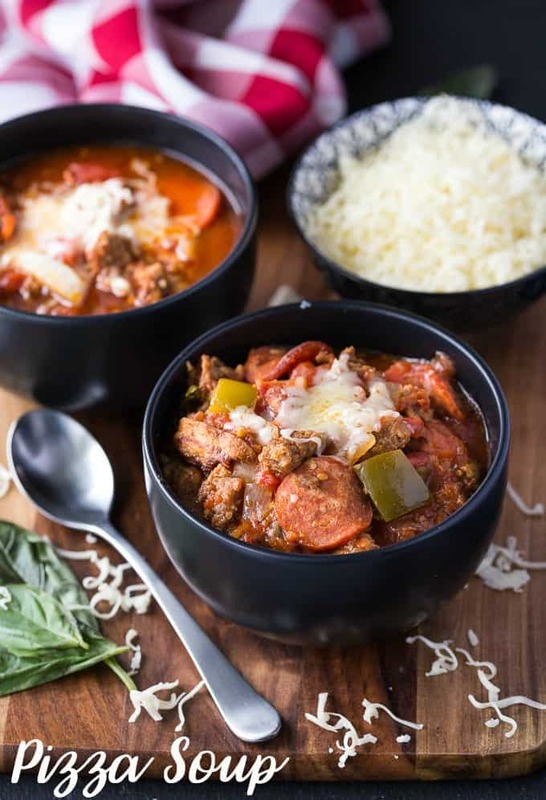 Any pizza lover will go bonkers over this easy pizza soup recipe. It is like pizza in soup form, except without the crust, so you get rid of some of the extra carbs! Turn on that slow cooker, slice, and dump, and wait for your home to smell like your favorite pizza place. I seriously could eat pizza every single day! My favorite pizza is homemade that is loaded with all the toppings. If I could ensure I wouldn’t gain weight, we would be indulging each night. 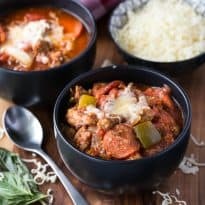 We all know that isn’t going to work, so I adapted a pizza soup in my slow cooker, to give us those pizza flavors, but is a comforting soup form. 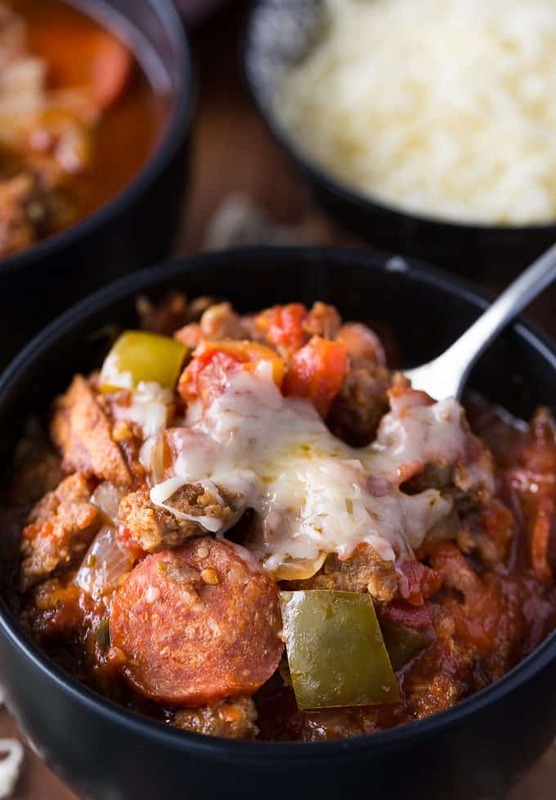 For this slow cooker pizza soup, I included pepperoni, bacon, and Italian sausage; I wanted it to offer a meaty component that would fill you up. I have to say this is a dynamic duo of flavor. Then toss in your pizza sauce and seasonings and allow this soup to cook all day and blend the flavors. 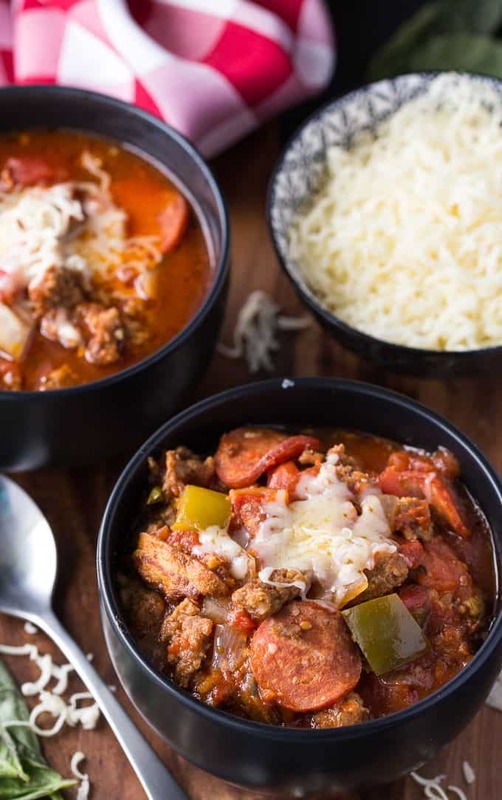 Trust me; you will be amazed at how outstanding this slow cooker pizza soup indeed is. Meats | Feel free to play around with what meats you want to use within the soup. I enjoy this trio of meats, but you don’t have to use them all if you are not a fan of one. Pre-Cook Meat | I like to precook my bacon and sausage to help eliminate the extra grease in the soup. Now if you don’t mind the grease than feel free to add it in and let it cook right in the soup. You won’t get that crunchy texture from the bacon if you don’t pre-cook it. Pizza Sauce | I get asked a lot what sauce to use. There is no set pizza sauce you have to use, just reach for a quality sauce that you and your family enjoys! Yes, you can make pizza soup on the stove top! Just cook up your meats, until done. Drain off extra grease, and then put in all the other ingredients. Allow it to simmer on low for at least 1 hour to help blend the flavors and serve. The one thing about this soup is the longer it cooks, the more the flavors blend and give you a more vibrant soup. That is why I reach for the slow cooker, but you can indeed cook on the stove top. You can freeze your pizza soup, and reheat it with ease. Just hold off on putting the mozzarella cheese on top of the soup, until you are ready to eat it. Place your soup in a freezer bag, or do an airtight container. Then freeze up to three months. For reheating allow it to thaw in the fridge the night before, and then pour in your slow cooker or pan on the stove to warm up. Then serve and enjoy like it was night one. One tip I wanted to share is if you love to meal prep, consider buying single-serve containers. This is a great way to freeze up your leftover soup, so then you can grab a container and take to work for a warm lunch. Just toss in the microwave at work and then dive in! I do this often since I can’t eat a whole thing of soup, so I eat some that night, and then spoon individual servings and freeze the rest. If you are like me and love pizza and soup than this recipe right here is a home run. We have made this to serve a crowd and just for my family. Everyone that has tried the pizza soup is always raving about it. Best of all, minimal work is required to get that incredible flavor of pizza in a soup form! Have you ever made a pizza soup before? 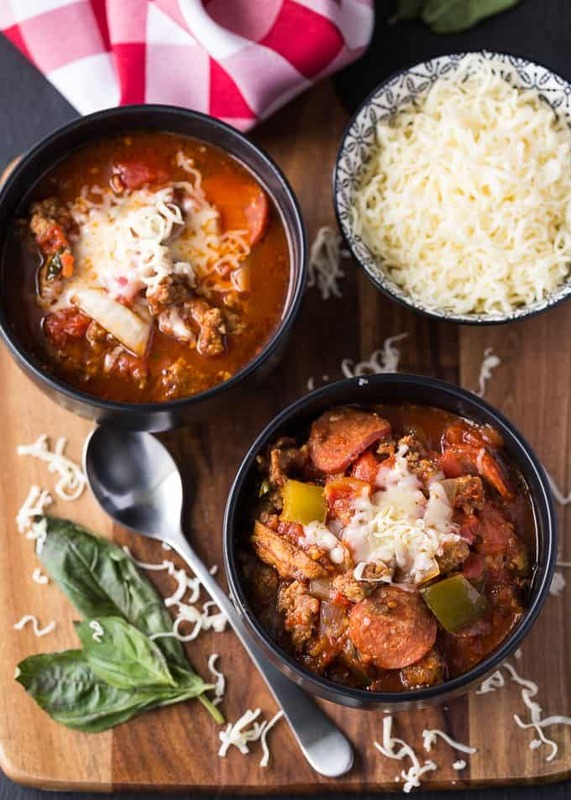 A simple slow cooker recipe for Pizza Soup made with all my favourite pizza toppings! Cook bacon and Italian sausage on the stove before adding to the slow cooker. Add in all the ingredients except the mozzarella cheese. Stir to combine. Add to individual bowls and top with mozzarella cheese.